Demonglass [Book Review] – my books. my life. Note: This is the second book in the Hex Hall series. There are spoilers for the first book. Sophie thought she was a witch. That’s why she was sent to Hecate to attend school with other paranormal kids. But when she finds out she’s a demon, her world changes. In Demonglass, she moves to England to live with her father, and Jenna and Cal come along. While Sophie is figuring out her powers, she considers going through The Removal to rid herself of them entirely. Add to the mix Archer Cross, her demon-hunting ex-crush, and Sophie has her hands full. I got to Demonglass a lot later than I intended. And as a result, once I started reading it, I realized I didn’t remember that much about Hex Hall. And honestly, now that I’ve waited months to review Demonglass, I can’t remember much about that either. Bad blogger. Don’t you hate when that happens? I liked Hex Hall a lot (despite my failing memory). Unfortunately I did not feel the same way about Demonglass. Demonglass takes us away from Hecate to the English countryside, and I missed the boarding school part of the story. It also kind of felt like there was a lot going on that I didn’t quite follow. I will definitely read the third book, Spell Bound, due out in March. I still really like Sophie and the boys are pretty crush-worthy. Sometimes middle books don’t live up to the rest in a series so I won’t let my lackluster feelings for Demonglass deter me from finishing. I really enjoyed Hex Hall, it wasn’t the best YA book but it was good. The ending has me really curious about this one. I’m hoping to read it soon. I find that is one of the problems with books in a series that are released so far apart. I have trouble remembering just what was so compelling about the previous books! I prefer to gather them all at one time, and read them back to back, but sometimes I am unwittingly tricked! It sounds like this book was not as good as the first in your opinion, and I am very curious about what you will think of the third! 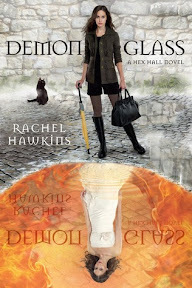 I think the problem with DEMONGLASS is that it is totally building up to the third book, which I always feel does the middle book a disservice. I understand why authors do this but at the same rate, I do feel that an author can build up to the final book without making the second one so forgettable. I am anxious to see how the whole thing ends though. I will definitely have to reread the series before I start on that final book though.